When it comes to termites, it's particularly important to know which exact kind of termite you are dealing with. This is because different types of termites require different extermination methods. If you exterminate against the wrong type, chances are it won't work. This is due to the different ways in which the termites invade and where they live and build their colonies. Some live in the wood while others live deep down in the soil around your house, busily building huge colonies of workers. Termites are known for swarming in the spring, summer and autumn. During the swarm they send out large numbers of winged, reproductive males and females that will mate, shed their wings and develop new colonies. These are the least dangerous, least destructive and least likely to invade your home. Dampwood termites need moisture to survive, and they thrive on eating damp and rotten wood. They are commonly found in wood piles outside your home, in rotten or wet siding or roof shingles, or under sinks in the wood of wet cabinets due to plumbing leaks. Dampwood termites can be easily prevented by moving all sources of wood and paper away from your home by at least a few feet. Maintaining your gutters, siding and roofing will help prevent any moisture buildup which would attract dampwood termites. Make sure to fix any plumbing leaks, even minor ones, in order to prevent dampwood termites. Getting rid of dampwood termites is simple. All you need to do is remove or fix the source of moisture that attracted the termites. Once this is accomplished, the termites will leave. Fermosan termites are a kind of subterranean termite and are extremely destructive. They even invade and destroy boats and live trees. 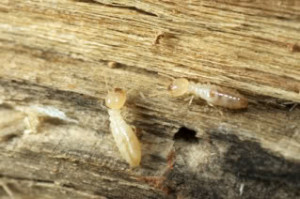 These termites live in warmer climates and are most prominent in Alabama, Florida, California, Georgia, Hawaii, Louisiana, Mississippi, South Carolina, North Carolina, Texas and Tennessee. However, they have also been found in smaller populations as far north as the Canadian border.